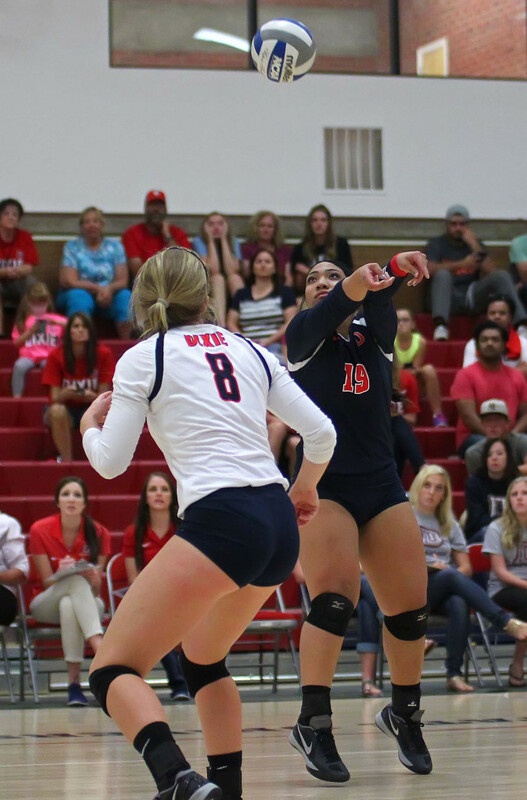 ST. GEORGE – The Dixie State volleyball gave a rude welcome to the newcomers of the Pacific West Conference. 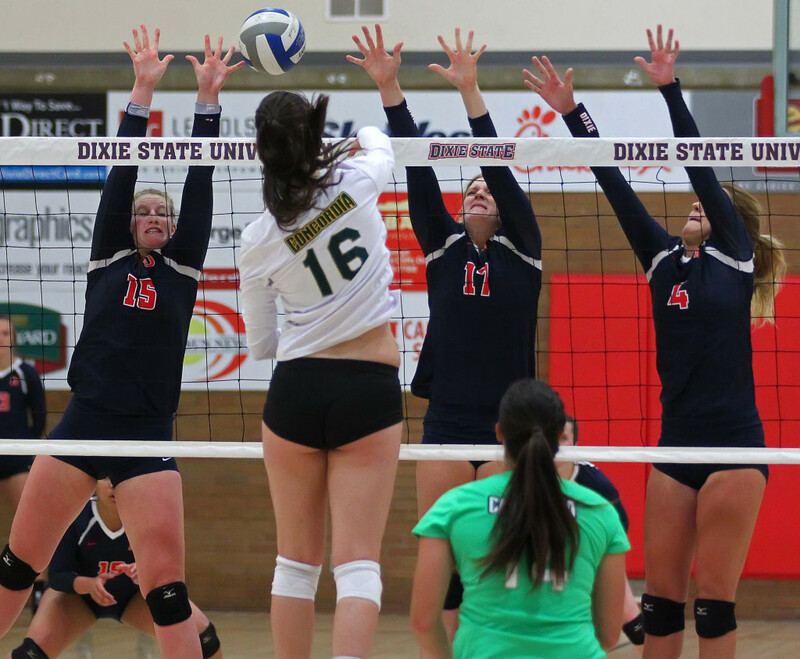 The Concordia University Eagles from Irvine, Calif., went down in four sets, 25-21, 26-24, 23-25, 25-23. Neither team enjoyed big swings of momentum the entire match. In the first set the largest lead for either team was four. The Eagles enjoyed the early lead 11-7 on Hannah Andrews’ kill. The Red Storm would even it quickly at 12 apiece. 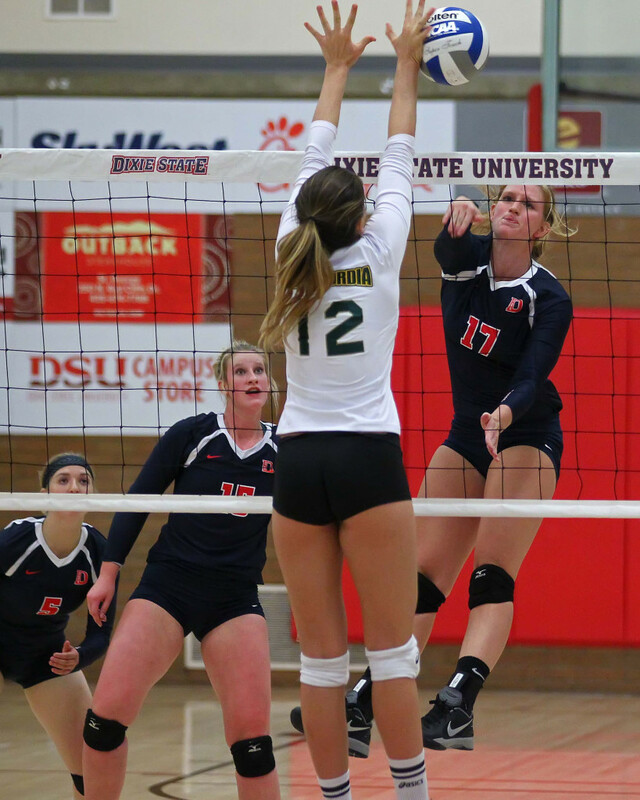 The eight-point swing was complete when Kailey Frei nailed a kill to put Dixie State up 21-17. 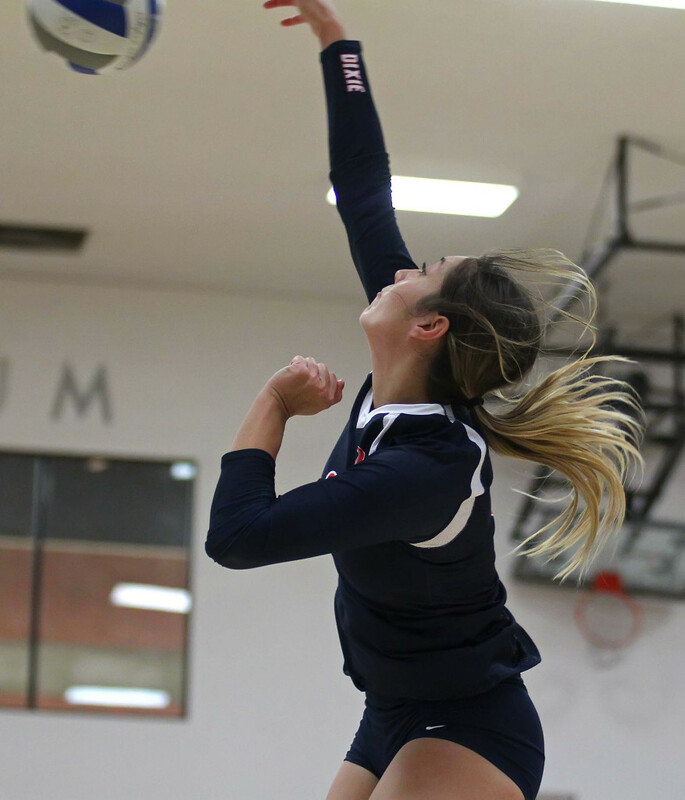 Brette Anderson closed the set in emphatic fashion with her kill across the middle. 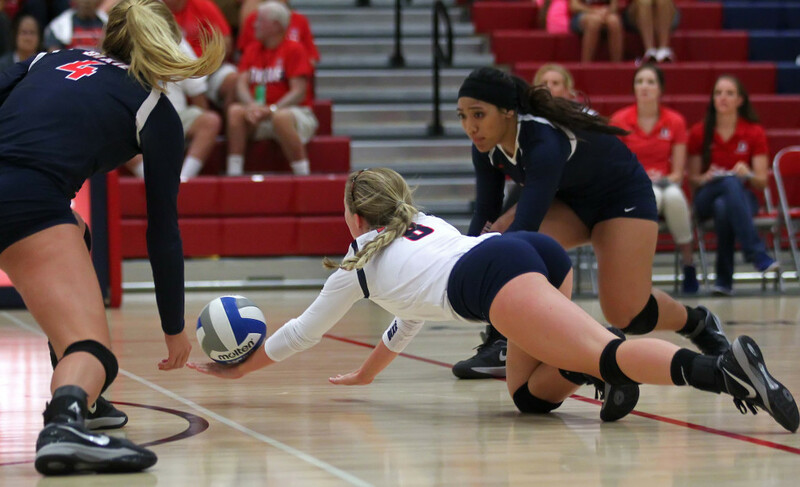 The close play continued in the second set when neither team would lead by more than three. Things looked ominous for the Storm when Rachel Flynn nailed a powerful kill to put the Eagles at game point, 24-23. 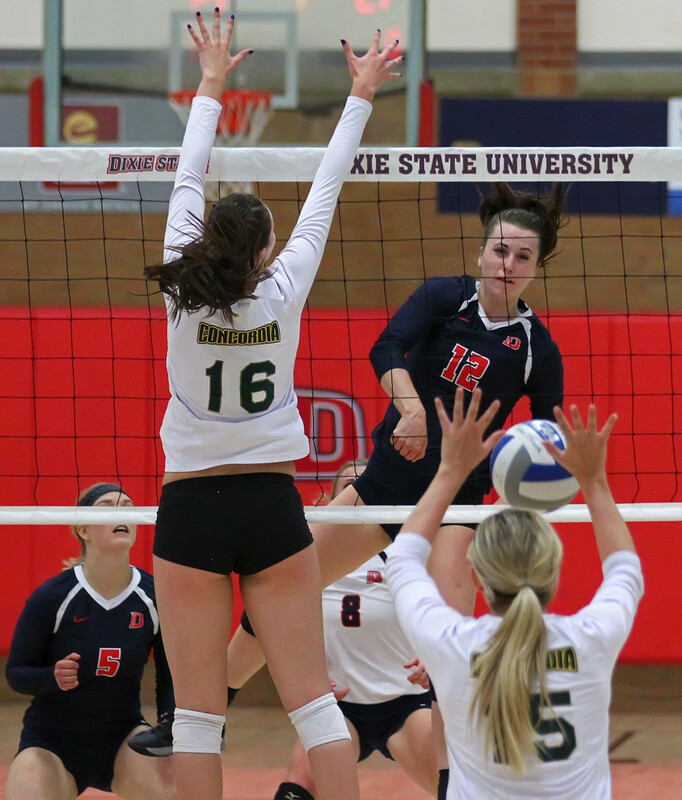 After a service error gave DSU side out, Concordia had an error on attack and Taylor Duryea closed out the set with a service ace. After intermission, the Eagles came out with determination. In short order, the CU lead was 10-5. 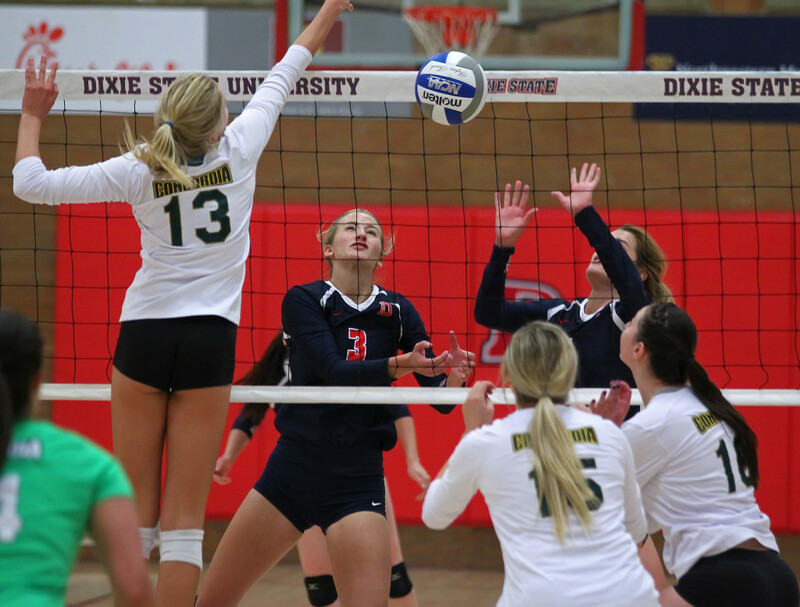 Dixie State climbed slowly back into it and pulled even at 12-12. 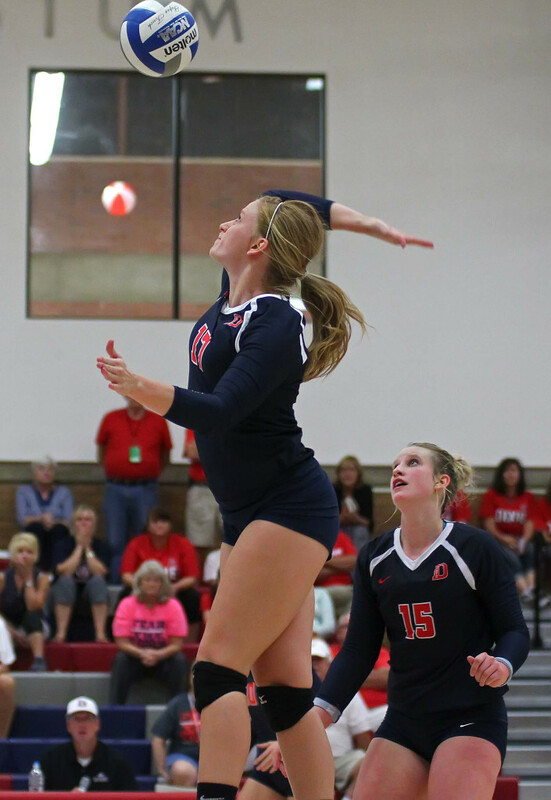 The Eagles responded with a 6-2 run and led 18-14 on libero Taylor Dennison’s service ace. 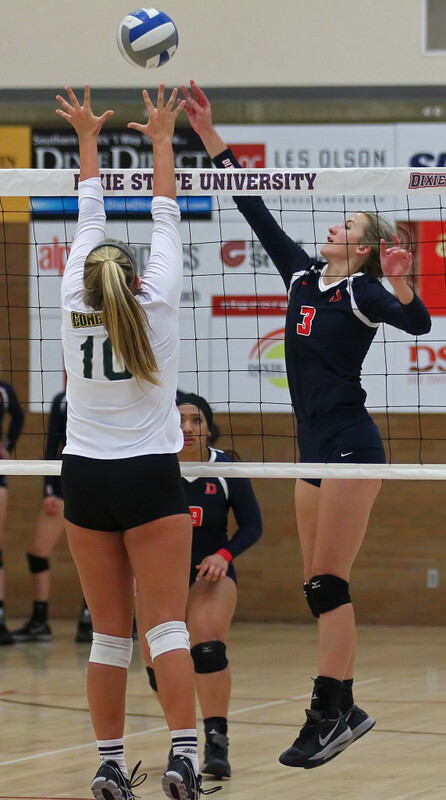 The Storm would tie the match at 20-20 on Makenzi Bird-Murphey’s kill and again at 23 on a service ace by Duryea. Concordia took their final timeout of the set and came back to score the last two points of the set. Both teams played even through the first part of the fourth set. Then the Eagles edged out slightly, holding a 2-3 point lead. 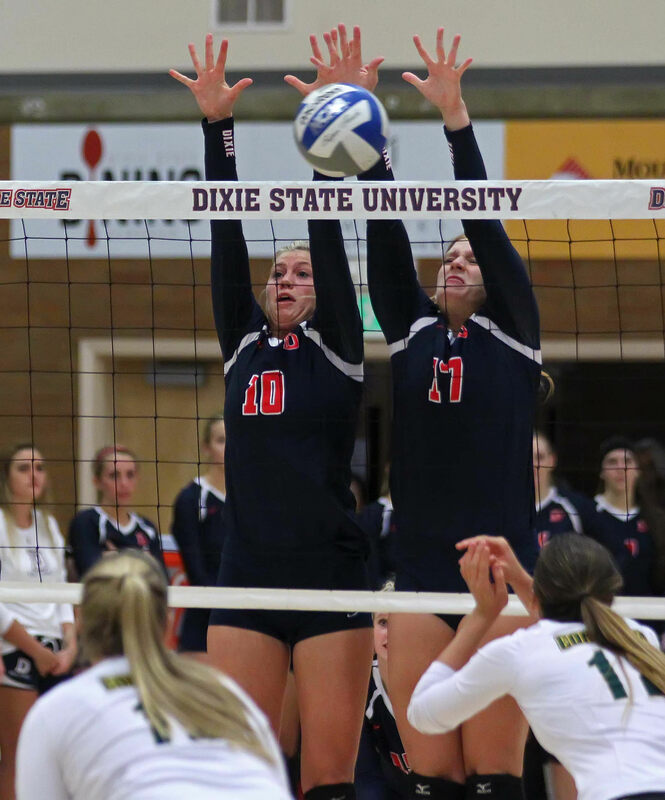 Dixie State finally pulled even at 19 on a kill by Duryea. Bird-Murphey gave the Storm its first lead since 7-6 with a kill off a nice set from Frei. Dixie State led 20-19. 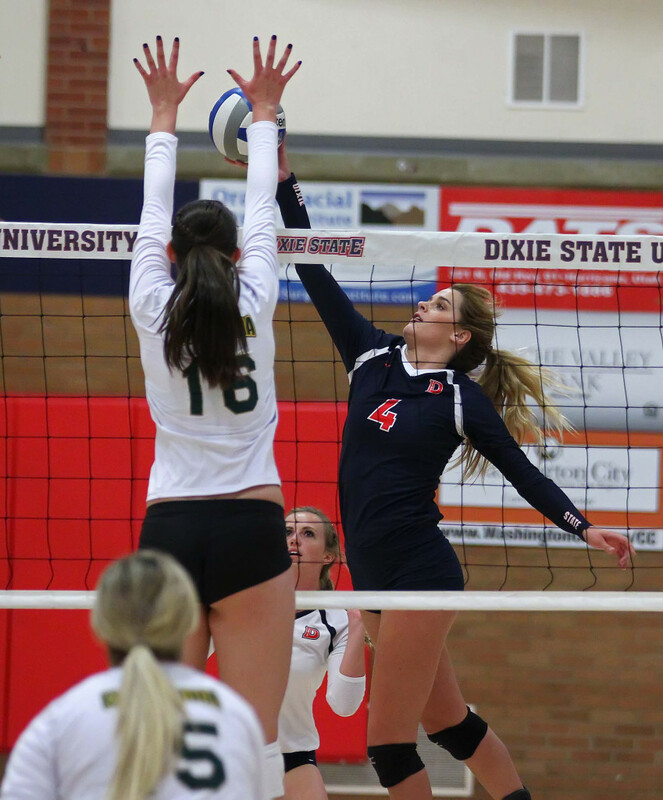 Both teams continued to play well, but Dixie was finally able to finish. 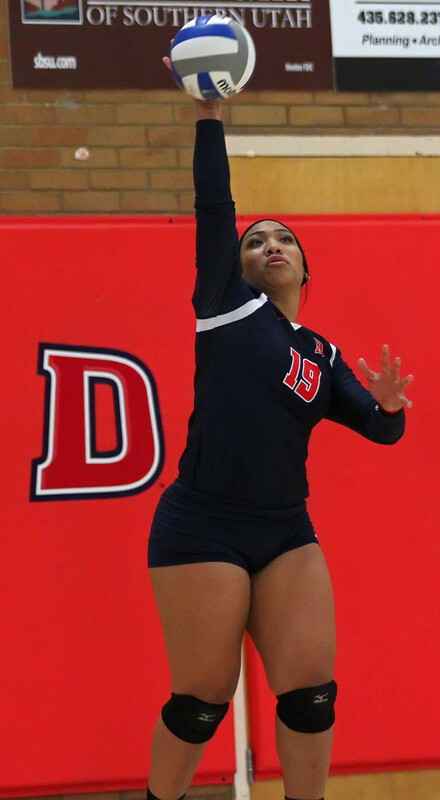 Gianna Kioa’s kill ended the set and the match. 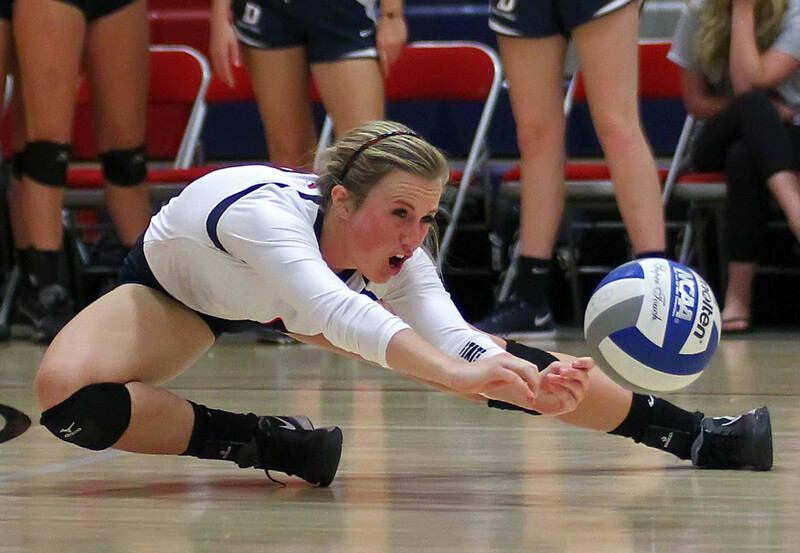 Duryea led the Storm with 11 kills. 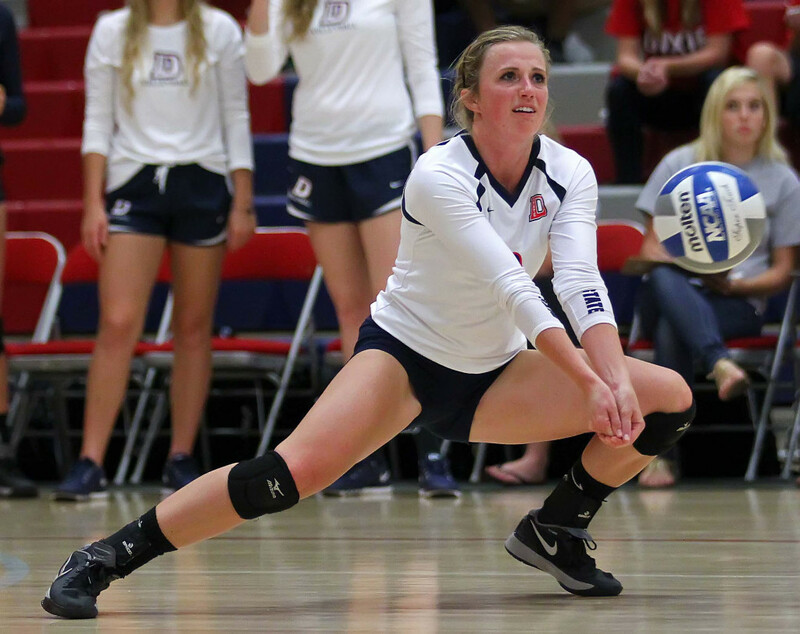 Lindsay Jones also had double figure kills with 10. Bird-Murphey, Brette Anderson and Gianna Kioa had nine, eight and six kills respectively. Frei led the team with 39 assists. 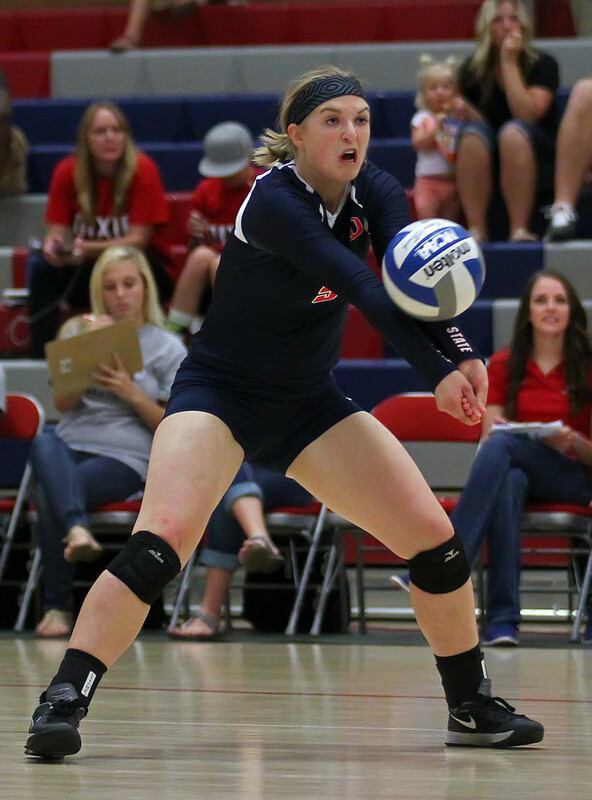 Libero Alex Anderson had 31 digs. 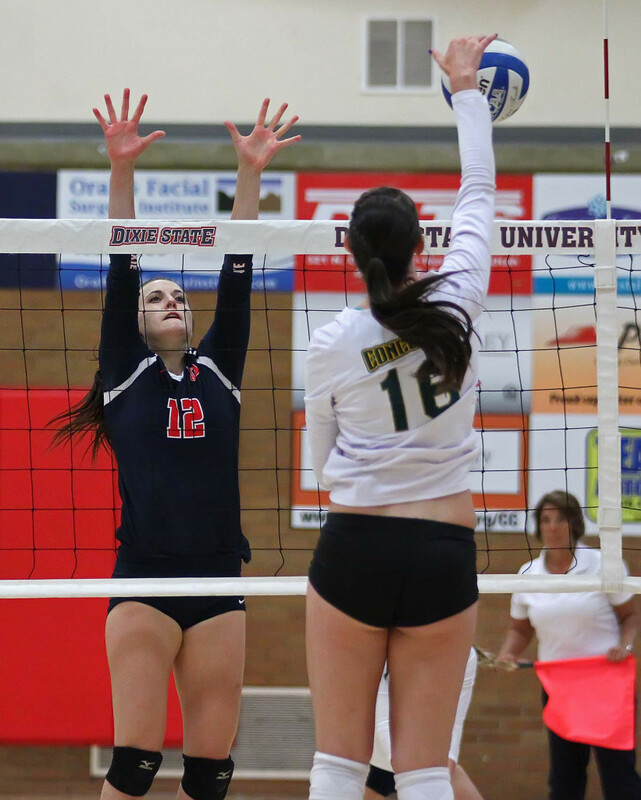 J Condie also had double figure digs with 14. 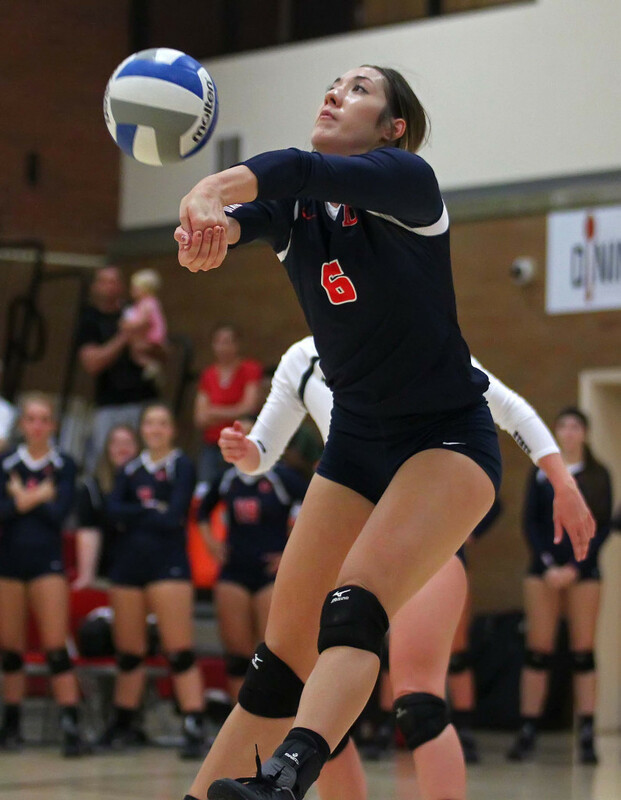 For the Eagles, Flynn had 20 kills and 17 digs. 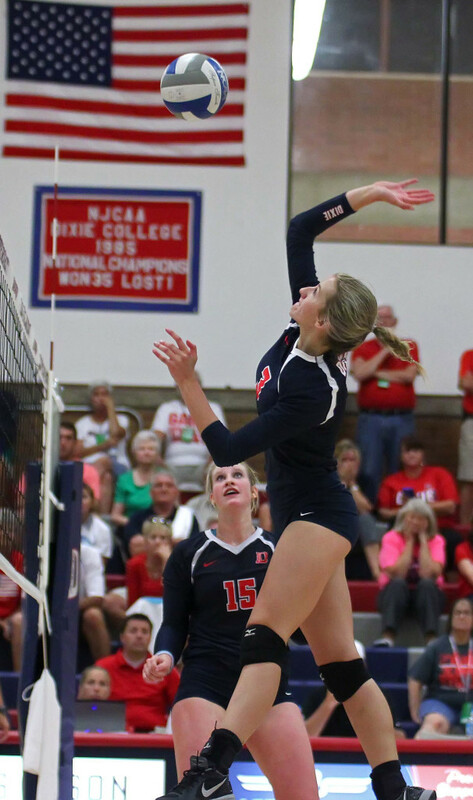 K Auten had 10 kills and two blocks. 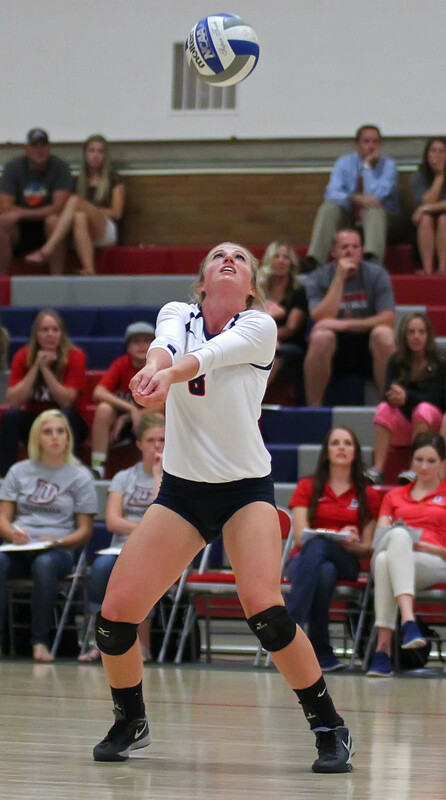 Dennison led the Eagles with 43 digs. L Grove had 28 assists. 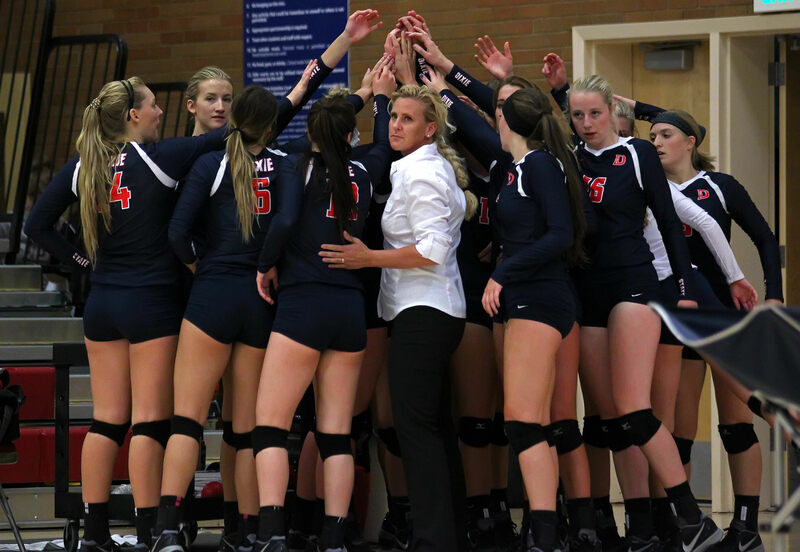 Concordia falls to 6-8 overall and 2-2 in the PacWest. The Storm improve to 6-7 and are riding a three-game winning streak. They are 3-2 in the PacWest. 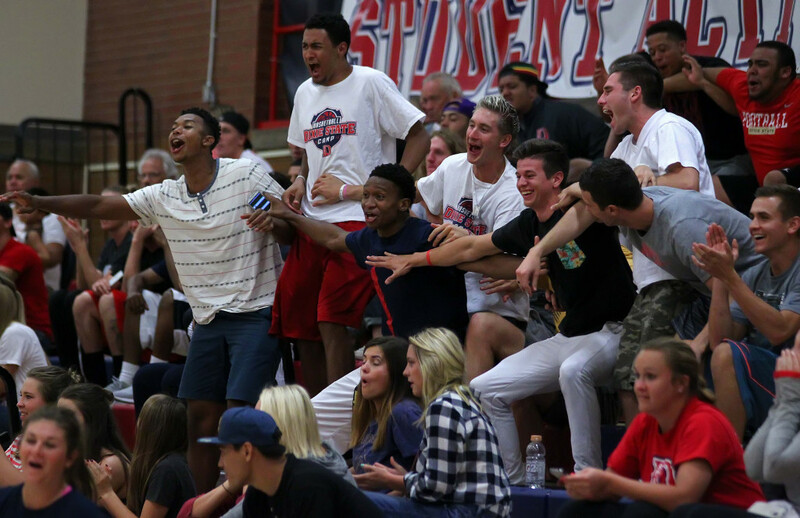 They will host the Azusa Pacific Cougars on Saturday at noon in the Student Activities Center (Old Gym).